It was the longest game in Kings history and the biggest goal in Shuchuk’s NHL career. The few years prior hadn’t been that bad for him either, be won the NCAA hockey championship at Wisconsin in 1990 and the AHL Calder Cup in 1992. Last week we sat down with Shuchuk to talk college hockey life in an interview published here. This week, he’s back to share memories of making to the NHL, Barry Melrose, the Kings, Wayne Gretzky, Dan Bylsma, Warren Rychel and more. You were taken by Detroit in the NHL’s Supplemental Draft, certainly something that didn’t have the hoopla of the Entry Draft. How did you find out the Red Wings selected you and did you have any idea that might be happening? There were rumors circulating that some of the guys in my class may get taken in the Supplemental Draft, something that was set up for the college guys. Basically, I didn’t know anything until that Sunday. I was in Edmonton and somebody called me and said ‘Hey your name is in the paper. You were drafted by Detroit.’ I said ‘Oh really?’ About six hours later I got a phone call from the Wings. They said congratulations, this and that…and we’ll talk to you later in the year. That was about it. Nothing really happened until I saw Nick Polano when we were playing up in Detroit. He took me into his office and explained they were looking to sign me at the end of the year. However, at that same time Sergei Fedorov was looking to defect from Russia. So, my signing waited until all of his paperwork was cleared up. Barry Melrose was your first pro coach with Adirondack (the Red Wings AHL affiliate). A few years later he ended up as the Kings head coach. When did you first have an inkling he was going to make a push to bring you to LA or were you surprised by the whole thing? When he got the coaching job in LA we were very good friends. He helped me a lot when I was in my first year in Adirondack. He made me a better professional, really helping me with the transition from college life. He told me to keep working hard when he left and said he would see what he could do. I remember him saying hockey was a crazy business and he hoped our paths would cross again. Sure enough, they were able to make a trade and bring me to LA along with Marc Potvin. I have the utmost respect for Barry. I learned a lot from him and he’s one of the reasons I was able to make it to the NHL. You played six games with the Red Wings during your first pro season and then spent the next two seasons in the minors. What motivated you on a nightly basis to keep hustling to make it back to the NHL? Getting an opportunity to play the first time gave me the confidence to know I could play at that level. On one hand, I had accomplished my dream. If I died I could say I did it. Here was a kid from Alberta that wasn’t supposed to play anywhere and I had played in the NHL. Getting that taste though is what gave me the motivation because I knew I could compete. I’ve never wanted to be denied anything. When people tell me I can’t do something it makes me try harder. You hear stories all the time about guys just biding their time. Davis Drewiske is one of them. You just keep believing in yourself and then when you get the opportunity you make the most of it. After you won the championship with Adirondack in ’92 did you think your pro career was about to take off? We knew we had a good team in Adirondack and Detroit wasn’t really giving guys the opportunity to get called up at the time. We kinda said ‘screw it.’ We’re going to play for ourselves and the guys in the locker room – the further we go as a team the further we’ll go as individuals. We felt that if Detroit didn’t want us, there were 27 other teams in the NHL that might grab us. It was an amazing mentality that we had. We were going for the Calder Cup, but we were also trying to help each other move on. And it worked out. It was great. You spent quite a bit of time with the Kings top minor league affiliate at the time, the Phoenix Roadrunners. There were some interesting characters with you during that period – guys like Byron Dafoe, Sean O’Donnell, Barry Potomski, Eric Lacroix, Tim Watters…what memories do you have? Lots of funny things. Rogie Vachon’s son Nick was there too. I had just gotten married and had a son. And the thing I remember most is that all those guys loved to golf. These guys would leave the rink and just want to golf, golf and golf. They would get to the point where it was so hot in Phoenix, they’d just dive into people’s pools – soaking wet, drain off and keep golfing. It was just crazy and they loved it. That group of guys…a lot of them were single at the time, so they came to the rink and did what they had to do – then they went out and enjoyed themselves. There was also a guy there named Dan Bylsma. Could you have ever imagined that he would go on to coach the Stanley Cup champions? At first no. Then the more I thought about it and talked about it, I would say yes. He was a very driven person and obviously still is. I guess he set his mind to it and he did what he had to do. I commend him on everything he’s done. He basically made a career of being a defensive specialist. Then, he worked his way through the minors in coaching. He was able to sell a system to a veteran team in Pittsburgh and they bought into it. He did a hell of a job. My hat’s off to him. You were coached by Dave Tippett when you were in Houston (AHL) in ’97. He’s getting a lot of attention for coach of the year this season in the NHL. Looking back on your time with him, are you surprised by his success at all? Absolutely not. I tell people this all the time…I admire Barry Melrose tremendously – yet, I learned so much from Dave Tippett and use many of those things now when I’m coaching. He was so smart. He would analyze the game as it was going on and he could change the system so quickly. He would say ‘OK guys, you look tired today. Let’s go back out there and trap a bit.’ And this was before the trap was even big in hockey. He was unbelievable that way. His demeanor was different too. When Dave started talking very quietly and slow you knew he was mad. When Barry was mad everybody knew. You didn’t want to be in the same room when Barry was mad. The thing I learned most from Dave is the way he would make adjustments throughout the game. He is unbelievable. You played in Europe for five or six years after you left the NHL…how would you compare the game over there – how is it different, what’s great about it…or maybe not so great? The amazing thing is you don’t realize how many guys are over there. Went I went my first roommate was a guy I had played with at Wisconsin who went on to win two Stanley Cups with Pittsburgh, Paul Stanton. I had lost touch with him. After he won his second Cup he had a contract dispute, went over there and played for 10 years. There are so many guys like that, people you thought were out of hockey and they’re over making careers in Europe. They’re making good money and there is less wear and tear on their bodies. Instead of playing in the minors guys were going over to Europe. It’s a great lifestyle. My kids went to an international school. They’re fluent in German. We were able to tour Europe. I recommend it to guys all the time. They get stuck in the minors here or stuck with a label, I tell them to look over there. They can really enjoy themselves. When you and Jimmy Carson were traded by the Red Wings to Los Angeles a major riff developed between Gretzky and Kings owner Bruce McNall because Wayne’s good friend Paul Coffey was part of the package sent to Detroit. Did you know any of that at the time and did you ever feel caught in the cross fire? Never. Wayne being the professional that he was and the classy guy that he is…I’ll tell you a story. We had our first game against Chicago and then went on a road trip. Me and Marc Potvin were kinda the outsiders. I knew Tony and Mike Donnelly from playing college hockey, but still. We were getting off the bus and Mark and I were talking, like ‘Hey, I guess we need to go get something to eat.’ Wayne came right up to us and said ‘You two guys are coming with me.’ It was me, Mark, Wayne, Jari Kurri and Kelly Hrudey. The five of us went to a little restaurant. He talked to us and said ‘Look, you’re going to hear stuff and it’s not true at all. Paul and I are very good friends, but it has nothing to do with you guys. It’s a business.’ He was very point blank about it. That helped us tremendously. Another guy you played with that has gone on to have success in a management role is Warren Rychel. He was the OHL (junior hockey) Executive of the Year last season. Could you have ever imagined that when you guys played together? Actually, this might sound weird, but yes. He’s always been a hard worker. He went up there with Bob Boughner and they’ve put a lot into a franchise that was in shambles (Windsor Spitfires). They won the championship last year and are really doing great things. He’s the same ol’ guy he’s always been – still making bad jokes and stuff. I’m really happy for him. 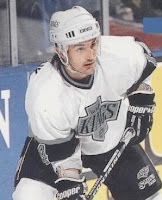 Any memories of the goalie controversies that surrounded the Kings in 1993 – from Kelly Hrudey to Robb Stauber to Rick Knickle and so on? A few things stand out I guess. I remember Kelly coming into the room during one of the games against Calgary in the first round and saying ‘I’m done!’ He said he had nothing left. I remember Granato telling him ‘No you’re not…you’re not done.” He said ‘I can’t stop anything.’ Tony tried to convince him it wasn’t him, it was the team in front of him. We felt bad for Kelly because we knew we weren’t playing our best. Ultimately, he was replaced by Stauber in that series who won it for us and then we moved on to Vancouver. Rick Knickle, let me tell you, he was an insurance policy. Hell, Rick has a lot of championship rings from outside the NHL, so he’s no slouch. We were OK with what Barry was doing, trying to motivate guys. Rick was part of the Black Aces – you know, reserve players who fill in occasionally. Rick was there in case anybody got hurt or needed a night off or something. It was a good thing he was around that year, we needed him. What is something people probably don’t know about Barry Melrose? People probably don’t know how caring he can be. It doesn’t come across on TV and stuff, but he has a big heart. When Marc Potvin died in 2006, my former teammate – that hurt. Barry came here for the service and was so gracious. His words and his actions towards the family were incredible. A little piece of us all died when Marc died…and honestly, I think a little piece of Barry died then too. He’s a wonderfully kind man who truly cares about his players. That’s the Barry Melrose that people probably don’t know from just watching him on TV. The run the Kings made in 1993 was magical, but we can’t do this interview without asking you about Stickgate. What do you think the impact was of the McSorley incident? Well, I think it’s unfortunate that so many people will remember that moment of the series. Come on, Montreal won 11 games in overtime that year. I remember Wayne telling us “Guys – this is unheard of…teams just don’t win this many games in overtime.” I also think about that goal that Montreal scored to tie the game on that Marty penalty. The play should have been whistled dead. It was off sides by four feet. Go back and watch the video. They come across the blue line and Kurri stops skating on the play. He thinks the ref is going to call offsides. He doesn’t and they skate in, shoot, rebound, score. It should have been offsides. But, as for Stickgate – well, there was more to the series than just that one situation. Your shining moment for the Kings in ’93 was the huge overtime goal you scored against Vancouver in the second round of the playoffs. What memories do you hold onto from that game? I probably remember the hit by Gerald Diduck (Canuck defenseman) more than the goal. I took a big shot from him at the blueline and had to go to the bench. Somehow I was able to talk my way back into the game. I went out there and scored, but to be honest I don’t really remember it. I was still shook up from the hit. Obviously, I saw the goal on TV later – so I know what it looks like. But, that hit rocked me good. There will be plenty of hits…and hopefully plenty of goals (for LA)…when the Kings take on those same Vancouver Canucks in the first round of this year’s NHL playoffs. Just like everybody knew about Gretzky, Robitaille and Kurri back in ’93, names like Kopitar, Brown and Doughty are getting all the big headlines so far. The fun part is wondering…who will be this year’s unlikely playoff hero? It seems like ’93 was nearly a lifetime ago…and it’s been eight long years since the Kings have been in the playoffs. It’s definitely time to make some new history in Los Angeles!